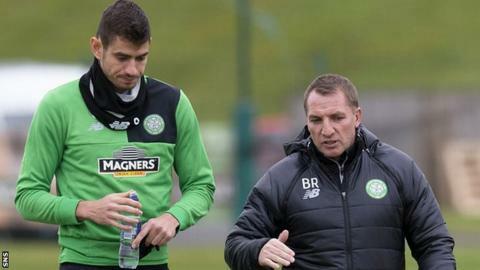 Celtic manager Brendan Rodgers has labelled criticism of stand-in defender Nir Bitton "absolutely incredible". Injuries to centre-backs Erik Sviatchenko and Dedryck Boyata have forced Rodgers to play midfielder Bitton in defence. The Israeli was part of the rearguard that shipped four goals in Kazakhstan to Astana, but still helped Celtic reach the Champions League group stage. "The criticism [of Bitton] is absolutely incredible," Rodgers said. "This is a guy who is a central midfield player - that's his position. I felt it was pretty clear that we actually had three centre-halves unavailable to play, two of which have been unavailable for most of our qualification campaign, and the solutions for us were very, very minimal. "This [Bitton] is a guy who after the first leg [against Astana], and after Kilmarnock last weekend, his foot was in a boot, he couldn't walk for two days, and right up until our last training session at the stadium in Astana, he just took his boot off and went out and trained. "Now probably nine out of 10 players wouldn't have played that night, but he put himself out there for the team and for the cause to get through, and I've got nothing but pure admiration for him. "And I know all the other players did, because he could have very easily pulled himself out of it and not played." Until Tuesday's 4-3 play-off second leg defeat by the Kazakh champions, Celtic had not conceded a goal in five qualifying matches. With European powerhouses Bayern Munich and Paris St-Germain, as well as Belgian champions Anderlecht awaiting his team in the group stage, Rodgers accepts Celtic's defence must improve. But the former Liverpool boss insists some perceptions of 25-year-old Israeli international Bitton are unfair. "I saw one report about it [fielding Bitton against Astana] being a £30m risk - you could argue it was totally the opposite," he said. "If we didn't have Nir Bitton, we might not have been in the Champions League. "I didn't hear many people saying he stepped out of defence and made the pass that created the [third] goal for Leigh Griffiths, or at Rosenborg when he came in and was fantastic, and in the home games. So guys like Nir Bitton were critical for us. "It's as a team we need to defend better at that level, of course, and that's something we'll always strive to do." Last year, Celtic earned three draws in a group containing Barcelona, Manchester City and Borussia Moenchengladbach, and Rodgers believes the experience of tackling Europe's elite will stand his players in good stead for the campaign to come. "The players will gain huge confidence from when they started the Champions League campaign last year to when they finished," Rodgers said. "We had some very credible performances against very top sides in that, and there was a lot of learning that took place. "I expect our game to develop as well. We get the opportunity, with all due respect, to work on counter-attack. A lot of our game domestically is based around possession, counter-pressing and creativity of chances. That's a different level altogether, where you're tested defensively in your organisation and of course at times then you're sitting in your block having to counter-attack, so this allows us the opportunity to develop that side of our game as well." Meanwhile, Rodgers hopes South Africa defender Rivaldo Coetzee passes a medical this weekend, and completes his move from Ajax Cape Town, while reaffirming his aim to add more new players to his squad before the transfer window shuts at the end of the month.